When temperatures hit tropical levels, I turn to this recipe for an easy, no-cook soup featuring cucumbers and lots of fresh herbs in a refreshing base. No matter what else you serve for midsummer meals, this soup is a great addition. Adapted from Vegan Soups and Hearty Stews for All Seasons. Photo by Ricki Heller of Diet, Dessert, and Dogs. Grate the cucumbers on a coarse grater, either by hand or in a food processor fitted with the grating blade, or quarter them lengthwise and slice very thin. Transfer the cucumbers to a serving container. 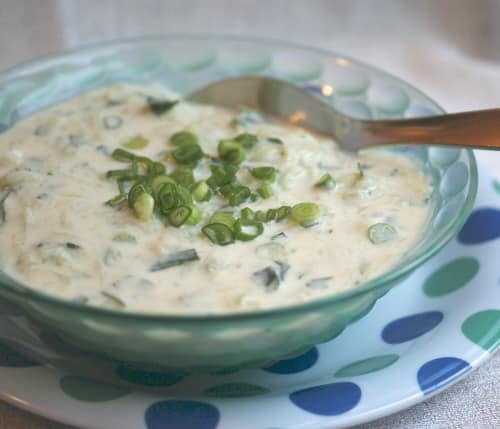 Stir in the sour cream, herbs, scallions, and enough rice milk to give the soup a slightly thick consistency. Season with lemon juice, cumin, salt, and pepper. Serve at once or refrigerate until well chilled. For a heartier version of this soup, add a cup or so of cold, cooked barley. For a pleasantly peppery flavor, stir in a good handful of chopped watercress leaves. I am wondering if it is possible to make this soup using coconut milk or paste in place of the sour cream or yogurt? I have a true dislike for the taste of vegan “sour cream” and I haven’t been able to find any coconut yogurt (although I’d love too)! coconut yogurt is getting to be pretty commonplace. I live in a not-too-large town and it’s available both in the supermarket and health food store. But do give it a try with coconut milk, which works great in cold soups. I can’t see why it wouldn’t work. You might need a bit more lemon juice to counteract the natural sweetness of the coconut milk. Let us know how it comes out! Debby — yes, you can use coconut mik, and I’ve added it to the recipe as an option for those who prefer to use it. I embrace cold soups but am wary of the extreme high fat of coconut milk in this recipe. Thanks for the info. I can’t find light coconut milk here so my nutritionist says to dilute it with half water. I am new here, I was just gifted your book by my NUT. “Wild about greens” and I can’t wait to try some of the recipes. I need to find your list of other books. This soup looks beautiful! Perfect for this time of year. I want to let you know how much I am enjoying your cookbooks. Very, very well done.